Welcome back to Meatless Monday on this warm summer day. 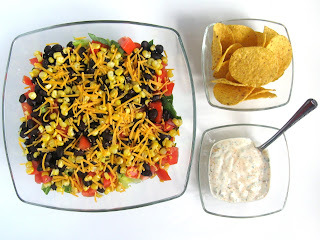 Today I am sharing Southwestern Salad with you which is cool and refreshing! I will say I did put avocado on this salad after we had eaten half of it because I forgot (oops). We were sitting there eating it for dinner and my husband said "avocado would make this even better". I jumped up and cut it up really quick because it was supposed to be on there...:) It does make it even better though. The fresh cilantro dressing doesn't hurt. I have never really been to much of a salad person but sometimes I just feel like one. You would think with me being vegetarian and all that I would eat salads all the time. Nope. Not so much a fan. I do eat them sometimes though and I like them with lots of toppings (like this one). 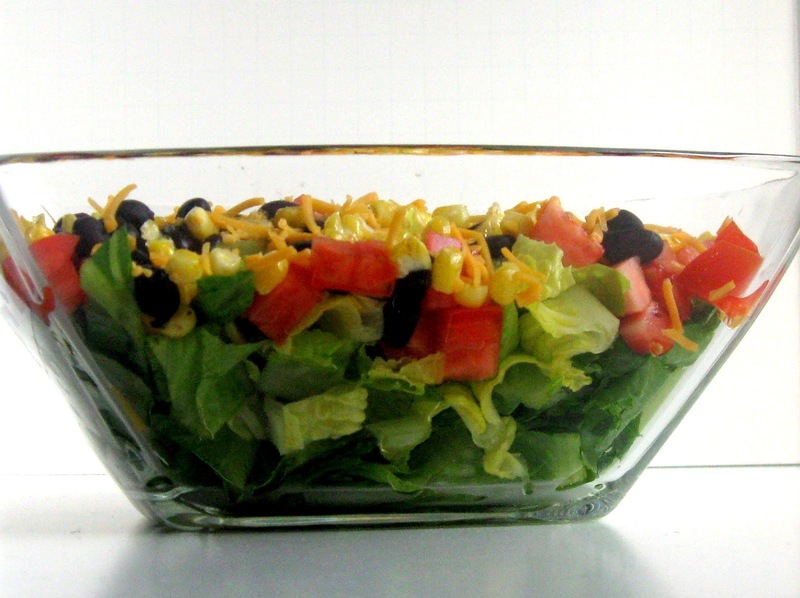 If I ever got a salad at a restaurant it was always the southwestern salad. I suppose I just like the spicy. This salad doesn't have much spice so don't be alarmed. 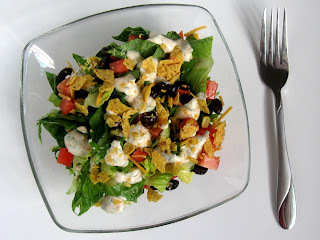 The only bit of spice is chili powder in the dressing and that's cooled by the sour cream. You could always make it spicy though, you know, if you wanted to. 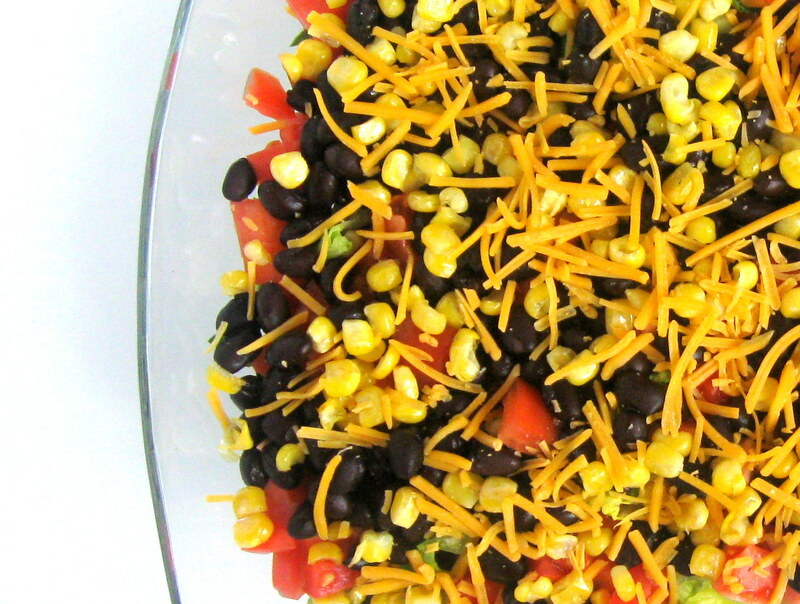 There are so many fun things you can do with this salad. You could add onions, red or green peppers, or even some jicama sticks. You could also just buy the pre-made tortilla strips if you wanted to but we already had yellow corn chips, same difference to me in my belly :). 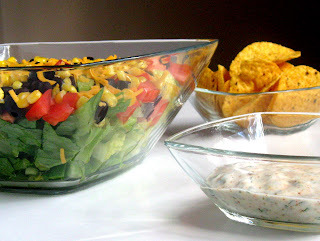 I served the salad with the chips and dressing on the side so that my husband could make his own as he liked it. I find that better also when you're serving more people because everyone likes different amounts of dressing or tortilla pieces on their salad. 1. 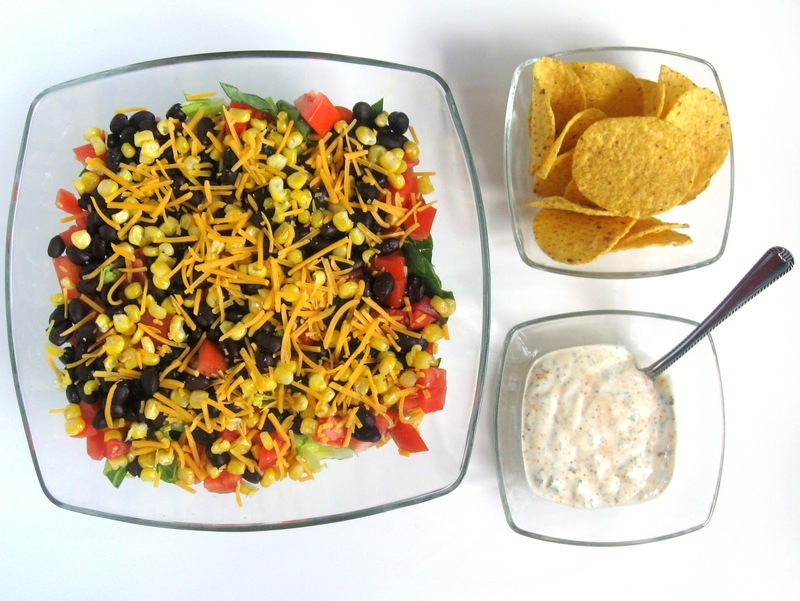 Prepare dressing: Mix together sour cream and next eight ingredients (sour cream-black pepper). Blend until smooth, set aside. 2. Heat about ½ teaspoon canola oil in a small skillet over medium-high heat. Saute the corn until lightly browned, 3-4 minutes, set aside to cool. 3. In a large bowl place all of the romaine. Layer the corn, tomatoes, and black beans. Sprinkle with cheddar cheese, then top with chopped avocado. Crush tortilla chips over the top of salad. Drizzle the dressing over the salad. Serve immediately or refrigerate. 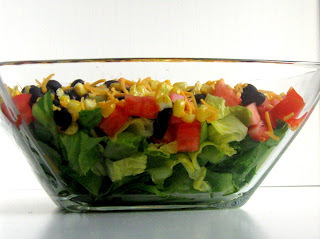 If you are going to refrigerate the salad then wait to top it with the chips and dressing.